One of the challenges facing the current Internet architecture is the incorporation of mobile and multi-homed terminals (hosts), and an overall lack of protection against Denial-of-Service attacks and identity spoofing. The Host Identity Protocol (HIP) is being developed by the Internet Engineering Task Force (IETF) as an integrated solution to these problems. The book presents a well-structured, readable and compact overview of the core protocol with relevant extensions to the Internet architecture and infrastructure. The covered topics include the Bound End-to-End Tunnel Mode for IPsec, Overlay Routable Cryptographic Hash Identifiers, extensions to the Domain Name System, IPv4 and IPv6 interoperability, integration with SIP, and support for legacy applications. An important compliment to the official IETF specifications, this book will be a valuable reference for practicing engineers in equipment manufacturing companies and telecom operators, as well as network managers, network engineers, network operators and telecom engineers. Advanced students and academics, IT managers, professionals and operating system specialists will also find this book of interest. 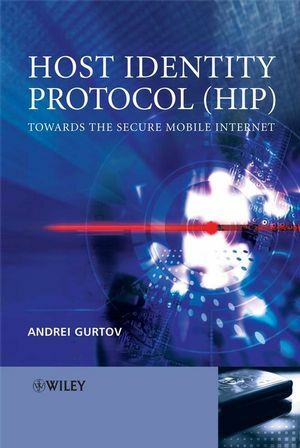 Andrei Gurtov is a senior research scientist leading the Networking Research group at the Helsinki Institute for Information Technology focusing on the Host Identity Protocol and next generation Internet architecture. He received his M.Sc and Ph.D. degrees in Computer Science from the University of Helsinki, Finland. He co-chairs the IRTF research group on HIP and teaches as an adjunct professor at Telecommunications and Multimedia Laboratory of the Helsinki University of Technology. Chapter 2: Introduction to network security. Part II The Host Identity Protocol. 3.2 Methods of identifying a host. 6.2 Piggybacking transport headers to base exchange. 8.1 Security functionality of HIP. 10.5 Host Identity Indirection Infrastructure. Chapter 13: Possible HIP applications. Chapter 15: Integrating HIP with other protocols. 15.2 The use of Session Initiation Protocol.